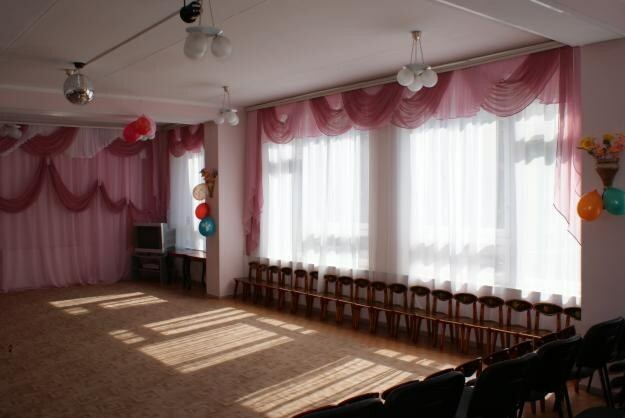 On the question of decorating the hall in the kindergarten for the prom parents usually think long before that momentous first graders for future dates. As such, each person in life happens only once, so mom and dad carefully tried to look as beautiful as you can, and to their children was nice. 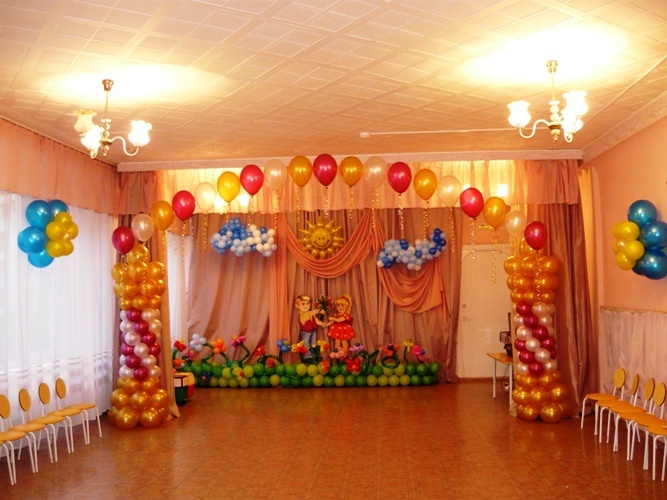 The scheme of decoration of the hall for prom in kindergarten usually depends on the scenario. 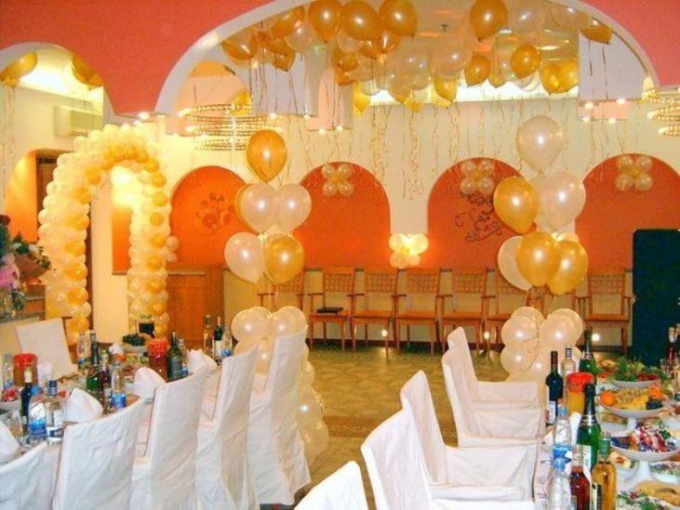 Although a good design of the room might give the organizers of the prom, the future first graders for the implementation of any original ideas or amendments in the script. Looks very interesting room, decorated in the style of train, which sang Crocodile Gena in the song "Blue wagon" from the famous children's cartoon. And the phrase about "floating away into the distance minutes" is the best spirit fit for the former (five minutes) kindergartners. To the colorful wagons made from paper and pasted on the wall or painted on a giant poster from a sheet of paper, you can stick photos of the graduates themselves, as if looking out of the Windows. To complete the picture of the "school" trains can be hand written poems about kindergarten and the school or just a few sentences describing each child. Well heads of this train have to do educators, gluing their pictures to the head carriage of the locomotive. But if you have to place chairs with tables near the walls, as if children travel in a real train, it will be at all memorable. And you may recall the famous and favorite of many parents, the expression "Children – flowers of life" on the walls of the groups to break real garden. Let the walls will show off the flowers depicted in any convenient way for you. And in the center of each Bud you can paste pictures of the kids. Don't forget about caregivers, who plays the gardeners with watering cans. To place will and pots of sturdy cardboard, is beautifully painted and studded with paper flowers in the style of origami. The kids love adventure. With this in mind, you can arrange a room for prom in the best traditions of the pirate, "spilling" on the walls Krugerrands, fancy trees, in the shade where the pirates are hiding. And the treasure will be the "graduate Diploma" that can be placed in a chest furnished in the form of a pocket on the wall (and for each party the "pirate prom") or an independent cardboard box. And let the children as if sailing on their ships to this island in search of his treasure. Just draw a ship and post it pictures of graduates, looking at the island through a spyglass. The ship's boys to let them be the teachers. And at the helm stand the head of the captain's hat. And don't forget the balloons. They come to the places on each outlet, no matter what style you have decorated the hall. And of course draw and place in the room a few posters with slogans such as "goodbye, kindergarten," "kindergarten Graduates" or "Congratulations future first-graders". The last bell has rung, passed all the exams. Then the moment of farewell to teachers and schoolmates. Prom bear parting with the childhood and opens the door to adulthood. With a sinking heart, girls and boys are awaiting the completion of their school career. The decoration of the hall for the prom is one of the most important steps in preparing for an unforgettable celebration. It is necessary to consider all the details. Prom happens once in life and must forever be remembered. For starters, take a look around and find out what color dominates in the interior of the hall. Take it as a basis and boldly proceed to the design of the room. Start decorating the hall with the very popular balloons. They will lift your mood and create a festive atmosphere. When making use balls no more than two or three colors. Hang them on walls and Windows in one or a few pieces. Doorways and columns adorn the voluminous arches and colors of the balloons. Especially solemnly it is necessary to decorate the main entrance to the room. All the arches is nice to blend in with the overall tone of the party, don't take up much space and does not obstruct the space. Use not only conventional bulbs, but filled with helium. Tie them to chair backs or other objects. Turn on your imagination, imagination and not be afraid to experiment. On each ball write a variety of fun wishes. Decorations apply Christmas tree lights. They will look very nice on the walls, around the perimeter of Windows and doors. These colorful lights will create a magical atmosphere on your prom. Hang on the walls posters with special greetings that are sold in stores. Make posters of your own. To do this, glue a few sheets of paper and attach to them the markers on the ropes. Here teachers, parents and alumni will be able to write to each other various desires. Place on the poster photos of their classmates. No celebration is complete without flowers. Put them in large floor vases and place at the corners of the hall, so they do not interfere throughout the evening. Take colored paper and cut out her flowers or bells. On each write a short poem about school. Then mount them on the walls or just lay on the floor. Make a garland of balloons and route them around the room. Room for music lessons in kindergarten - a special room, because the children here for the first time are attached to this art. Let the standard recommendations for design will serve as a starting point for the implementation of their ideas. - book children's songs and poems. Arrange the benches in the music hall images of staves, notes, keys. Hang on the wall pictures of various musical instruments, both classical and folk. You can cut them out from magazines or coloring books. It is also good to place the image of the musicians, ensembles, orchestras such as the hapless Quartet from Krylov's fable. Draw on a large piece of drawing paper markers or paints a picture of a musical staff and seven notes in the key of "Sol". Stave it is better to paint a dark, black or dark blue. Treble clef color contrast, but not too bright to hurt the eyes, and notes – in seven basic colors of the rainbow: red, orange, yellow, green, blue, Indigo and violet. Place in large printed texts of poems and songs, to making music hall was not only colorful, but also carried some interesting information. Change the look of some stands, depending on the festivals and events that take place in kindergarten. Put them on photos of events, stories about them, congratulation to the little artists. Place on the stands of the installation of children's art, dedicated to some events: summer holiday, the onset of autumn, New Year, Mother's day and all other holidays. Transform the entire interior of the music hall to the big holidays like New Year. Hang on a Central wall of the hall, a large, wall poster, suitable to the occasion, for example a winter landscape for the New Year. Change the curtains in the hall: for the autumn holiday, pick curtains in gold, red, orange colours; winter white, blue, silver, spring green, light yellow. On glass Windows and curtains, you can attach the image of the fruit in the fall and corn in winter – snowflakes and other attributes of the holiday, spring and flowers. Prom is not so much the road to adulthood, as the end of childhood. School will soon be forgotten grievances, difficulties and love. So farewell you need to make a joyous and memorable. The situation could not be better helps to create the right atmosphere and mood. Before buying material for decoration of the hall, you must immediately think of, if not the entire concept, then at least the General plan of decoration. Decide the main color scheme. You must have one primary and a couple of extra tones. Overly colorful decoration looks tacky. To create a holiday atmosphere by using vivid details. They put the necessary emphasis. Of course, hall decoration depends on many factors. You need to consider the budget to match the decor with the holiday program, to determine the room. 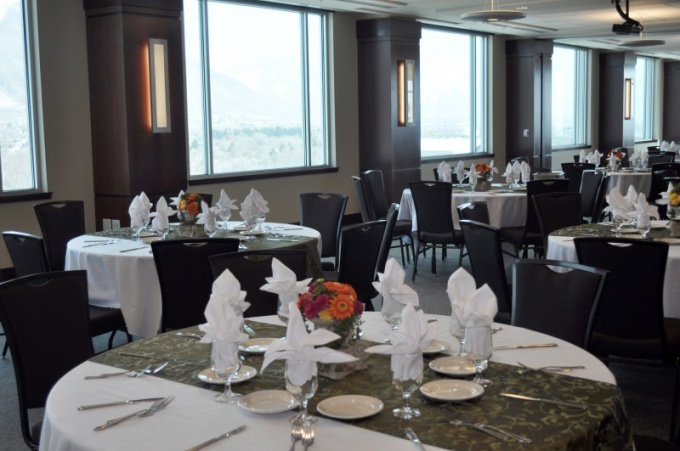 If you need to decorate a hall for congratulations and awarding of certificates, and a separate restaurant, both rooms will require different materials. If everything will be in one place, OR you need to arrange just the reception, makes the task easier. Make a big batch of balloons for decoration. Of them it is possible to build columns, through which will pass the graduates. To create them you will only need the solid wire, which will serve as a frame. The remaining balls if they are filled with helium, can be positioned on the ceiling. Threads hang the cardboard numbers: threes, fours, fives. Since prom is an evening of farewell to the school, it would be nice to refresh memories spent in it. Print photos from memorable moments of the life of each of the graduates and their classes. Make several large photos and hang them on the walls. It's a good alternative to bored posters. If the gala dinner will be held at a cafe or restaurant, its decoration will be limited to the same balls and a couple of unusual items on the tables. In the case where the reception organized on their own, will have to make more of an effort. Buy fabric to withstand the room in a single color. It drape the window and cover the tables. To make the cushion chairs that do the same rectangular piece of fabric and sew the tape to their sides. Now put them on the seat and back tie bows. On each table place a bundle of balloons or put unusual lamps. Need to pay tribute to nostalgia. Make a large cardboard heart, glue it to paper pockets and put it on the output. Let the students write their teachers notes of thanks and wishes. By the way, the cardboard scenery can serve as a basis to decorate the hall. If at the buffet only one class, you can print out large silhouettes of famous people and stick to them the faces of the graduates. It will kind of look into the future. Try not to be trite, because this day is for children never to be repeated.